John’s positive experience led him to persuade more of his family to relocate to Texas from New York. In 1889, the Christian Scharbauer family followed him, settling in Midland. Young Clarence had managed a paper route in New York, quickly became interested in the family business and soon took over a herd in Stanton, Texas for his Uncle John. As Clarence got older, he attended school in Midland and continued to work on the ranch after school and during vacations as he acquired his knowledge of the ranching business. After graduating from high school in 1898 and attending a business school and Baylor University for a time, he returned to the Midland area to make his way in the cattle business. Christian and John continued the family’s success in the livestock industry and in 1901 the brothers organized the Scharbauer Cattle Company which operated for more than a decade before being dissolved in favor of operating the business as individual ranches in 1912. Clarence homesteaded near Fort Stockton and in 1908 he married Ruth Cowden. Together they had two sons: John Christian who was killed at the age of 13 in a riding accident and Clarence Jr. 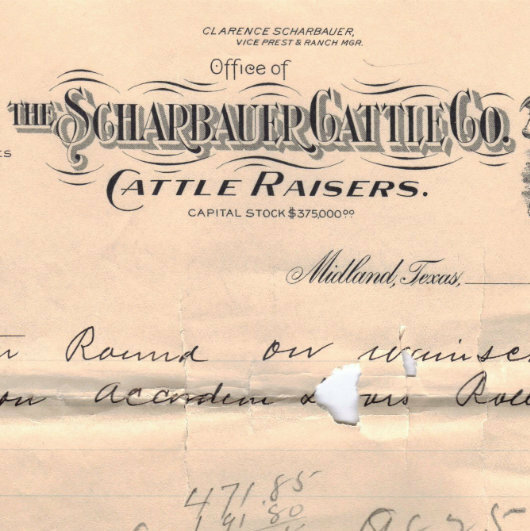 In 1914, the Scharbauer Cattle Company was again organized with Clarence as the manager. Under his leadership, the business prospered until it was one of the largest ranches in Texas. Oil was discovered in the 1930s, further securing the family’s success. Clarence was active in civic affairs and over the years had served as an officer or director of a number of firms including the First National Bank of Midland and the First Mortgage Company of Midland. He was a charter member of the Midland Chamber of Commerce and served as a director of the West Texas Chamber of Commerce. He was named “Top West Texan” in 1938. He supported many other entities and projects that he felt would bolster the Midland area and was active in First Baptist Church of Midland. He built the Scharbauer Hotel in 1927 which was a downtown landmark until its implosion in 1973 to make way for a newer hotel building. Clarence passed away in 1942, but the family business continues. Clarence will long be remembered for his lifetime of work, his many contributions to West Texas and for the organizations he built and supported. The Scharbauer Cattle Company had a ranch near where I grew up in Lea County, New Mexico. Dad and the ranch manager were about the same age and got to know one another. Dad worked in the oilfield and we lived a few miles away in a production camp. Dad had grown up on a farm in Wise County, Texas and been around cattle, horses and mules all his life, so from time to time he would go over and help out at the ranch. He recalls repairing windmills, working cattle and also going over to milk the cow when the manager took a rare vacation. Once when the ranch manager and Dad were riding, the horse Dad was on named “Banjo” stumbled as they went down a slope and Dad almost fell off. The manager joked that “Banjo” had unloaded a lot of cowboys before, but he was the first “oilie” (oilfield worker) that he had unloaded. On weekends, the grownups would get together for games of “42” that would last on into the night. I remember the ranch house well. My sister and brother would play with the rancher’s daughter in one of the bedrooms. The living room had a big leather sofa where I would sit and read back copies of “Western Horseman” until I could not stay awake any longer. After a while, I would lay down on the sofa and go to sleep, usually with the magazine over my face. I can still remember the smell of the print of the magazine. Both the ranch manager and his wife are gone now, but left us all with good Scharbauer Cattle Company memories.